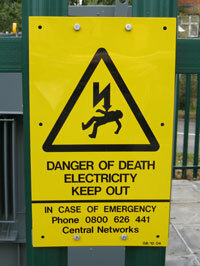 Pylons and substations always have a prominent notice saying "danger of death". This is nothing to do with EMFs. It is there because of the obvious danger of electrocution if someone gets too close to the live conductors by infringing the safety clearance distances.